The Ivesheadiomorphs are a group of rounded, high-relief, irregularly-arranged clusters of lobes and troughs, typically found in the oldest, deep-marine assemblages of Ediacaran fossils. They can reach up to 1m in diameter, and although many of them have circular or ovate outlines, they can also be extremely elongate in overall morphology. They were originally considered to be jellyfish (Boynton REF), discrete taxa (Boynton and Ford, 1995), and >?? ?, but in 2011, it was suggested that they may be taphomorphs, recording the partially decayed remains of organisms that had died on the seafloor some time before burial by event beds (Liu et al., 2011). Counter-suggestions that they may instead be microbial colonies (Laflamme et al., 2011) or sedimentary loading structures (Wilby et al., 2011) have been proposed, but most authors appreciate the role of microbes in the formation of these structures. An important implication of the taphomorph (also known as the "effaced preservation") hypothesis is that Ediacaran fossil assemblages may preserve significantly time-averaged communities, recording a mixture of living and deceased organisms on the bedding planes (Liu et al., 2011, 2015). 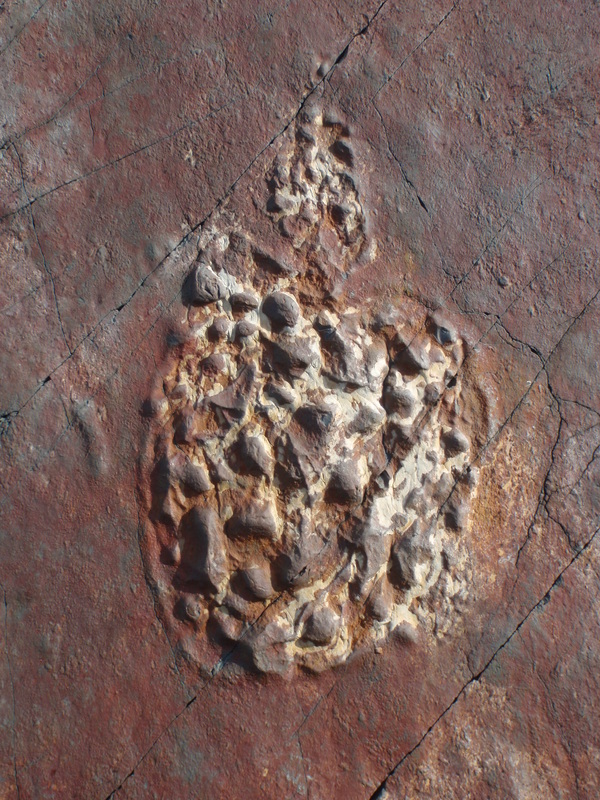 Ivesheadiomorph (also referred to as a 'pizza disc') from the Drook Formation of Mistaken Point Ecological Reserve, Newfoundland.